Does it prioritise best practice planning, design, engineering, procurement and maintenance? Is there leadership with a vision, and which generates a commitment to the integration of design and quality? Have best practice case studies been used to inspire and provide benchmarks? Is the project innovative and creative? For example, does it demonstrate pioneering initiatives and exceed benchmarks for design, social outcomes or sustainability? Does it use quality materials and craftsmanship throughout? Can the place be used by any person of any ability? Does it fully adopt and promote universal design standards? Is there a clear process to prioritise design excellence and sustainability? Have clear and measurable design outcomes been defined and prioritised? Has progress toward the vision been monitored throughout the process? Have the benefits of good quality design been promoted and implemented throughout all aspects of project delivery through to completion? Has the project been reviewed by design advisory or review panels, and has feedback been incorporated into the scheme? Has the selection of consultants been based on a thorough and transparent process? For example design competition and review panels. Do the consultants engaged in the project have appropriate skills and expertise? Is there a integrated design approach in which professional disciplines are working collaboratively at all stages of the project? 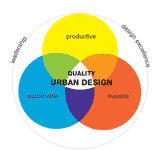 For example urban designer, traffic engineer, land economist, architect, landscape architect. An advisory body to the Australian government and an innovation advocate for addressing innovation challenges in the built environment industry. A comprehensive national voluntary environmental rating system that evaluates the environmental design and construction of buildings and communities (Green Building Council Australia). A multi-disciplinary team of design specialists and public and private sector professionals working together to provide leadership, expert advice and strategic direction to achieve a more sustainable, design led, urban form. A panel providing independent and authoritative advice to government and statutory decision makers across Victoria about the design of significant development proposals. A publication offering a range of structures and policies on making better places for consideration by local authorities (Commission for Architecture and the Built Environment (CABE), UK, 2002). A guide containing expert advice for people involved in commissioning and managing building projects (CABE, UK, 2011). A tool for evaluating the design and construction of new buildings and the refurbishment of existing buildings (Construction Industry Council, UK, 2002). A project bringing together twenty-five city agencies to work towards a greener, greater New York (New York Office of Long-Term Planning and Sustainability, 2007). A report providing tools and techniques for achieving a robust audit trail for design quality throughout the planning process (CABE, UK, 2003). A dynamic online platform of sustainability resources and peer-networking opportunities. A guide summarising essential knowledge needed for planning and leadership decisions (CABE, UK, 2003). A compendium summarisng the principles of urban design, how they can be applied and the processes which lead to successful places (Homes & Communities Agency, UK, 2000). A tool for guiding place-based investment decisions and assisting state and local jurisdictions in assessing market conditions and their affordable housing and community development needs (US Department of Housing and Urban Development). The UK’s National Planning Policy Framework sets out the government’s planning policies for England and recognises design as a vital part of delivering sustainable development.